Feature: The adhesive seals well, but will come off without damaging the Outer sleeve. 500 DVD case labels on roll, clear polyester pre-printed with SECURITY DEVICE ENCLOSED in black type over a white stripe in center of label leaving the edges clear. 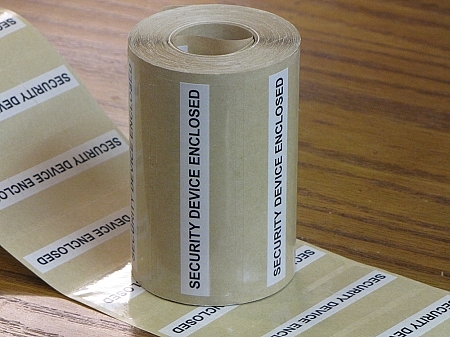 Labels are 3 1/2" x 1 1/4" with rounded corners and will seal your finished product in a professional way.